I received my March FabBag yesterday. Tadaaaa! 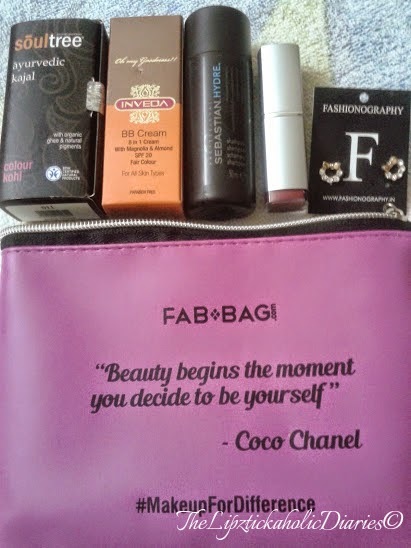 My March FabBag and the lovely products that came in it! Themed for Women's Day, the bag was full of natural products for makeup and skincare. I was so excited that I wanted to open up all the products and test them right away. But The Husband said, “Wait! Wouldn’t Baby D wanna “play” with your makeup too? Better wait until he’s off to school and you have your time to experiment with these!”. Now when your Man, holds back your over-excited self to give some great advice like this, you know you’ve married the right guy! Hehehe what say? I waited and Gosh! It was great; I got plenty of time to create this look (Read - a good 15 mins without my toddler screaming Amma! Amma!). I used the InVeda BB cream as a base. It doesn’t give enough coverage per se, actually leaves a slight grey cast when you apply it, but smells divine! 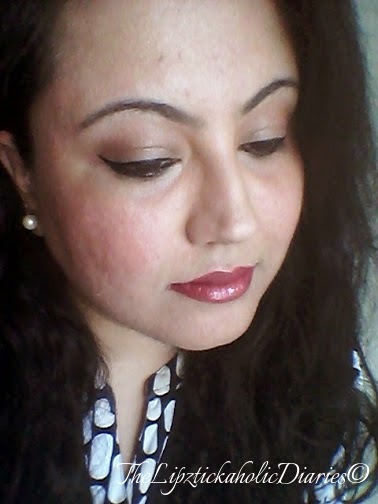 I used my Maybelline Dream Lumi Touche Highlighter pen to conceal the undereyes, nose, cupid ’s bow and chin. If you wish, you can skip the highlighting and concealing step. Next I used the SoulTree Kajal in Pure Black to line the waterline. 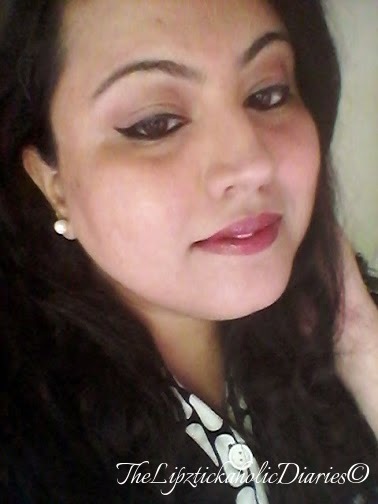 For the upper lashline, I used the Maybelline Collosal Eyeliner which I won in a recent YouTube giveaway. I have close-set eyes and it helps me give them an elongated look. 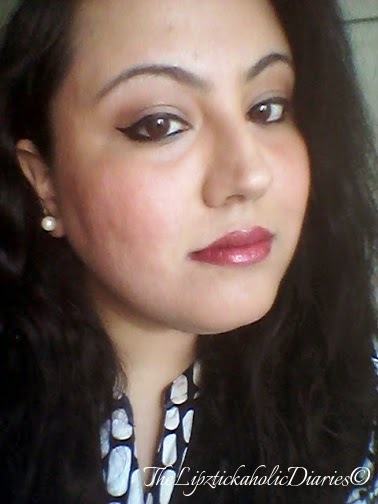 Then I used the Palladio Lipstick in Rosey Plum on my lips. I loved the colour but wasn’t comfortable with gold, frosty finish. So I used my Maybelline Lip balm over the lipstick to give it a glossier look and eliminate the frosty gold finish. I’m yet to use the Sebastian Professional Hydre Shampoo & the Fashionography earrings from the bag, but I really liked the 3 products that I used viz. 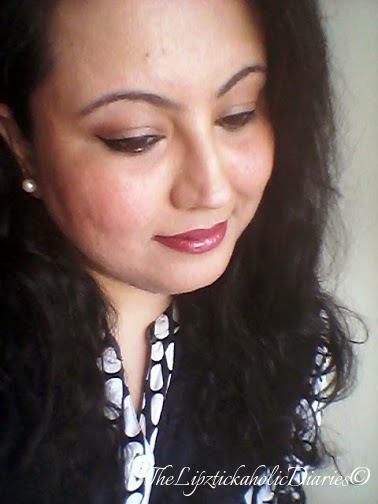 InVeda BB cream, SoulTree Kajal and the Palladio Lipstick! This is a simple look with Defined eyes and Rosey Plum lips. It’s great for parties or special occasions and you can re-create this quick look when you’re pressed for time! Hi Neha, very pretty look.